Happy New Year 2013 from B’z! 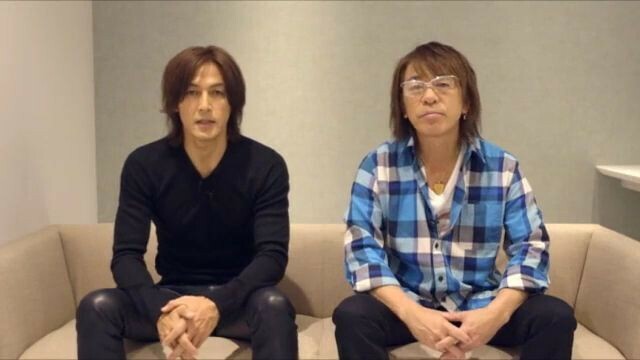 As with every year, B’z has posted a message for their fans on the official fanclub’s website. B’z is now truly 25 years old as the band was founded in 1988. Look forward to those three upcoming LIVE-GYM releases and let’s see what the band has got in store for us this year! We at OFF THE LOCK also wish you all the best and a happy new year! That’s awesome, I wish them a happy und succesfull year 2013 too. Still I demand access to the B’z fanclub as a non-asian fan. Hey everybody, a happy new year to all, even it is a bit late;). Here is the fishy person again and this person has a question again(it is unbeilevable,(and perhaps impertinent , I know:). But, (Iknow ,I am stupid) how ,on earth catch you these vidiotaping? I am an old H.. about the Inaba ‘s age , I think, Iam very stupid. Happy new year to you, too. As stated in the article, the video has been published on B’z PARTY’s website. You have to be a fanclub member to view it. Hey , that was very, very quick :)). Even , if I am impolite, do you live for answering any ??? I salute you for this site everytime I have a glimpse of it, too. A member to B’z fanclub , you have to be more than to know the Kanji , I think. Was genau möchtest du mir sagen? Ich verstehe nicht ganz. auf keinen Fall wollte ich Ihnen zu nahe treten. Es ist genau so gemeint , wie es geschrieben steht. Ich bewundere diese Seite genauso, wie sie ist. Ebenfalls bewundere ich Ihre Kommunikation in Japanisch. Meine Wenigkeit hat da ein paar Probleme. Es ist nichts Negatives . Falls ich diesen Eindruck hinterlassen habe, entschuldige ich mich.
Gome nasai gozai masu :). P.S, Meine Japanischkenntnisse beruhen nur auf einen knapp 6 monatigen Unterricht. (mit mehren Wochen Pause). Mehr war leider nicht drin .